As the Finance Director for Mountain Village in Telluride, Erin Neer saw gaps in the government accounting system that she thought she could fix. “Technology in government systems hasn’t evolved as quickly as it has in the private sector,” she deduced. Her product, MUNIRevs, allows businesses to log in to a secure, self-service portal to renew licenses and submit their taxes to the municipality where they conduct business. They can log in, report sales and pay taxes in minutes. 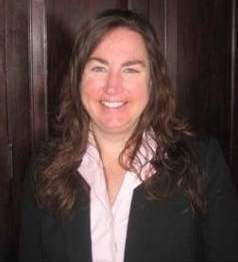 Her patent-pending software will save government agencies significant time and money in processing. It also makes it easier and more convenient for small business owners. She chose the name MUNIRevs, and the slogan “Capture Every Dollar,” because she realized that the automation and web-based technology of her system creates enhanced revenues for municipalities and reduces their processing costs. Neer spoke to Joe Keck about her confidential business plan and asked for assistance where she needed it. Keck, “as a huge resource,” connected her to advisors Gary Masner, John Skowlund and Jim Mackay, who had expertise in areas that she needed. Masner provided his expertise on RFP’s (Requests for Proposals) and securing government bids. Skowlund helped with Sales and Marketing, as well as formulating pricing models, and Mackay helped with the Technology and Funding aspects of the business. Since August of 2011, the MUNIRevs paperless system has processed over $8 million in revenue – with the first payments being submitted in December of 2011. 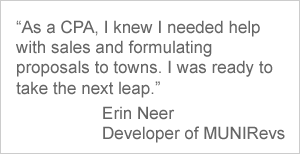 MUNIRevs also won a competitive RFP for the City of Englewood, Colorado, and Neer is thrilled that that several other communities have indicated they will be coming online as well.